The state of Jammu & Kashmir came into being as a political entity in 1846 with the treaty of Amritsar on 16th March 1846, between the British Indian Government and the Maharaja Gulab Singh. The three regions Kashmir, Jammu and Laddakh came under the rule of Gulab Singh, the Hindu Dogra Ruler. The Jammu region consists of plains bordering the Punjab and the broken mass of the foothills known locally as KANDI areas. On account of being its mostly strong and arid, cultivation here is scanty, scattered and wholly dependent on rain. The whole of Jammu district and part of Kathua fall into this region. Rest of Jammu Province, i.e. district of Udhampur, Poonch, Doda, and part of Kathua fall in the outer hill region. 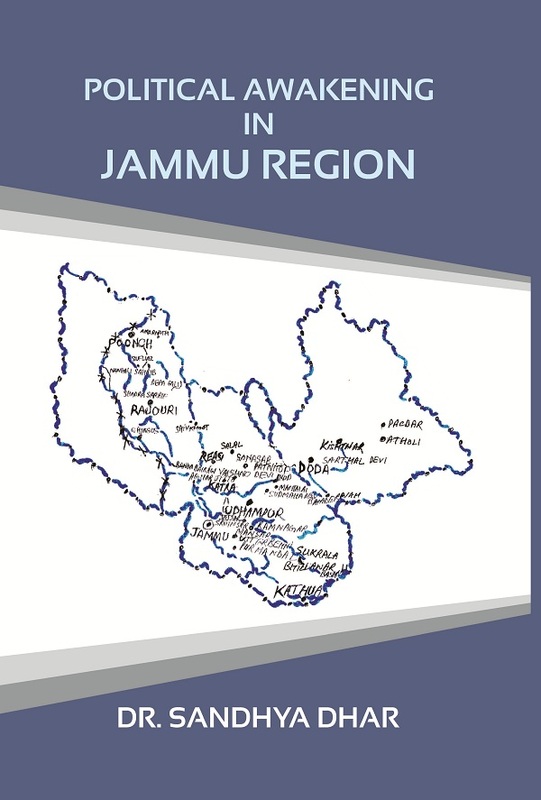 This book chronicles all the important facts and figures of the history of Jammu and Kashmir. Wish that this book is useful for those who want to know the reasons responsible for political awakening in Jammu Region. Dr. Sandhya Dhar, a native of J&K state, got her graduate degree from Parade College Jammu, Master Degree in history, M. Phil in history, Ph.D. in history from University of Jammu. She got her B.Ed. Degree from Varanasi Vishwavidyalaya, Varanasi. She has presented a no. of papers in Saminars, Conferences, Indian History Congress & Punjab History Conferences. She worked as a Principal in Kasturba Vidhayalya run by Kasturba Gandhi National Memorial Trust Jammu ( National Organisation) & as a Superintendent in Short-Stay Home for girls & women run by K.G.N.M. Trust Jammu 1990 to 1994. She worked as a Lecturer in Udhampur women college from 1994-1995 & in Rajouri Degree college from 1995 to 1996 & 1996 to 1997 as an adhoc basis. She has a long teaching experience of different schools & colleges.